Stacy Julian spoke at the Album Retreat I went to and one of the things she said was one in five posts should be about the story of life, not just a photo of an event. I think that means the details about life, like what is your child's favorite book or what makes them smile, or what has changed about them recently, etc. I love this page as the title page of the album I made at the Album Retreat. It is all about capturing the details of life! This page is so funny to me because My family always has to take a silly picture at the end of every photo session, even if it is just at after 2 posed pictures at the pumpkin patch. So it really captured on of the details of our family and what a great opener to a new family album. Pretty much everything on this page except the Laughing Lola print and the photo mat was cut on the Cricut with Artbooking, amazing right!? We used Laughing Lola, Frosted and several colors of card stock, including, Lagoon, Whisper, Goldrush and Black. 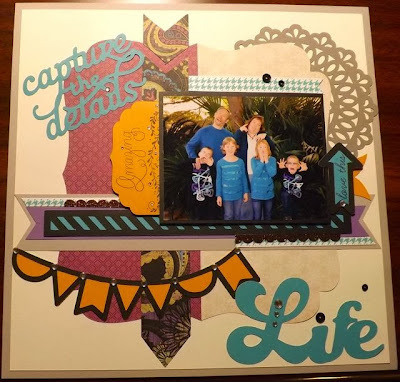 We layered, the banner and the border to get fun contrast of color and texture! Dovetail was one of the words of the weekend! Dovetail this and that and then Washi Tape out the whazoo, not meaning I didn't love it but it seemed like we were always using or doing both! Speaking of Washi tape they had us put the Lagoon Houndstooth Washi tape over White Daisy card stock here to bring out the Lagoon! We also blinded it up a bit with Sparkles and Black sequins from the Black Mini Medley and of course scallop punched Bronze Shimmer Trim!! I can't believe I have forgotten to mention my Scallop Border punch got quite the workout this weekend with paper and Shimmer trim and it worked fabulously! Retiring Products and Thanksgiving Special! Just Chillin' in the Now?